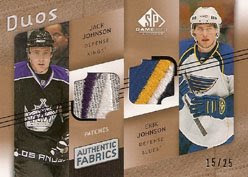 Since the NHL lockout ended, there hasn’t been a set that I’ve anticipated more, year in-and year-out, more than SP Game-Used. I’ve been fortunate, 3 of those 4 years to break a box, and this year’s might very well have been the most fun. Weighing in at six packs, each with three cards (give or take a couple that have more than the stated insertion), SPGU isn’t for every foil ripper – it’s definitely a more elite set; but thanks to monster sales, the gamers show up on the secondary market in droves, letting every collector get a piece of the action.